Another beer, another forgotten picture, so thanks to A Tattooed Tale for theirs. This is definitely not the way to wind down an inadvertent Beer Plow- a rye ale aged in rye whiskey casks, sitting at a brain-bashing 12%. As I've said before, Boulevard kind of confounds me. I've had each of their year-round Smokestack series beers (Tank 7, Sixth Glass, Double-Wide, Long Strange Tripel, and Dark Truth, with a review of the last waiting in the wings), and I've been underwhelmed by all but Tank 7 (by which I was evenly whelmed), despite Boulevard's sterling reputation. But their limited release Smokestacks are supposed to be world-class, so when I saw this at Bridgetown Beerhouse in Portland, I thought I'd go for it. It's a highly attractive beer. The head makes it look Belgiany, which makes it even more inviting. The smell makes me think it's Belgian too- in addition to the spicy ryeness and obvious fruity/oaky/sweet whiskey aromas, there's an additional fruit layer that makes me think of bananas. I'm not generally a big fan of whiskey barrel aging (see below)- but this is pretty good as far as that technique goes. 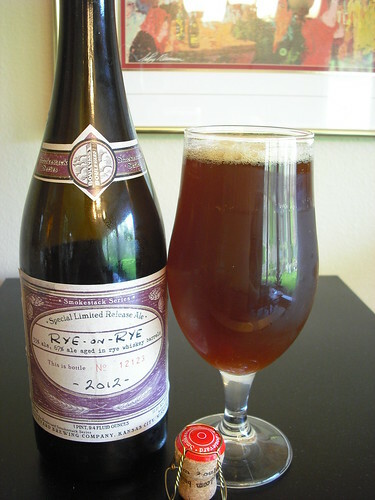 The rye brings a strong peppery spiciness, and since this is fairly lightly hopped, it doesn't come out dirty-tasting like some rye-PAs you find. The whiskey contributes the most potent flavors to the party, particularly in the form of some pungent booziness and a bunch of sweet brown sugary flavor. There's a nice vanilla accent floating around in there, which might be my favorite part of the whole deal. It leans pretty heavily to the sweet side, making me worry that I may have trouble finishing the bottle (but Chris, why are you trying to drink a whole 750 of 12% Rye-On-Rye by yourself in the first place? Because I'm a goddamn Non-Snobber, that's why), but that's a common characteristic of these barrel-aged SOBs. From the flavor, this ain't Belgian (the banana thing isn't there)- but it makes me think a Belgian version of this could be worth a shot. So I do enjoy this. But here's my problem with whiskey barrel-aged beers. The beer ends up tasting like whiskey Obviously that's the point. But if I want something that tastes like whiskey I'll just drink a glass of whiskey. I want beer that tastes like beer. I don't say that to pick on this beer- it's one of the better barrel-aged ones I've had. It's more about the philosophy- I just can't say that I think that barrel-aging in general elevates beer to a higher plane (with a few exceptions- KBS being the first that comes to mind). As far as Boulevard's limited Smokestacks go, I'll hold my opinion in reserve until I get to the bottle of Saison Brett I've had cellared in Colorado for many months.